There is a common teaching among Christians that claims we are to offer unconditional forgiveness to all who do evil against us (and others), followed by reconciliation. Some teach that we are to allow this cycle of offense, forgiveness, then reconciliation to continue forever (70 times 7). Is this really what Jesus commands us to do? To forgive sin under all circumstances, unconditionally, and to reconcile with the unrepentant offender communicates a false gospel. It is not biblical. This is not what God does, nor is it what He commands us to do. However, to be unforgiving of sins against us by others also communicates a false gospel. So what is a believer to do? In an attempt to answer these questions, I ask you to consider forgiveness and reconciliation in the most radical sense in order to put these teachings into perspective. Cast off petty offenses such as forgetting to bring a pie to a long-ago Christmas dinner or being late for an appointment. Instead, think of something truly wicked that has been done to you, or to someone you love, not unknowingly, but with premeditation and malice a situation in which you have come face to face with evil. With that in mind, imagine the perpetrator pridefully denying his or her wrongdoing and refusing to repent, yet demanding your forgiveness and reconciliation because, "After all, you are a Christian, and this is your obligation." Now what? Perhaps it is more helpful to define what forgiveness is NOT. Forgiveness is not ignoring, disregarding, tolerating, excusing, overlooking, or closing one's eyes to the sin of another person. It is not simply letting time pass after the offense has been committed and then "getting over it." It is not resigning one's self to the other person's sinful actions by saying, "Well, that's just the way s/he is and I"m stuck with her/him for life, so I'll just accept it." It is not letting things "roll off our backs"or agreeing to make a "fresh start" without confronting the problem. To engage in these behaviors not only condones sin, but also perpetuates it, and as Christians, we are forbidden to do so. Jesus himself gave us a three-step model of forgiveness among believers in the Gospel of Luke. He said: "Take heed to yourselves: If thy brother trespass against thee, rebuke him; and if he repent, forgive him. And if he trespass against thee seven times in a day, and seven times in a day turn again to thee, saying, I repent; thou shalt forgive him" (Lk. 17:3-4) (emphasis added). Step One: Rebuke -- Jesus clearly tells us that if a "brother," meaning a believer, sins against us, we are first to rebuke him. What does this mean? To rebuke is to criticize sharply, to reprimand. This plays nicely into the Christian principle of speaking the truth in love. To rebuke a brother is not an act done with a hateful or prideful heart. No. In fact, it could easily be compared to the behavior of a loving mother correcting her child for a behavior that will bring harm to her child and/or others. She may raise her voice and speak sternly, but she does so with a loving heart and tongue. We are to rebuke our brothers privately, and with humble hearts. "Moreover if thy brother shall trespass against thee, go and tell him his fault between thee and him alone: if he shall hear thee, thou hast gained thy brother. But if he will not hear thee, then take with thee one or two more, that in the mouth of two or three witnesses every word may be established. And if he shall neglect to hear them, tell it unto the church: but if he neglect to hear the church, let him be unto thee as an heathen man and a publican. Verily I say unto you, Whatsoever ye shall bind on earth shall be bound in heaven: and whatsoever ye shall loose on earth shall be loosed in heaven. Again I say unto you, That if two of you shall agree on earth as touching any thing that they shall ask, it shall be done for them of my Father which is in heaven. For where two or three are gathered together in my name, there am I in the midst of them" (Mat. 18:15-20). In the practical and relational sense, repentance begins with the offender recognizing his or her wrongdoing. This recognition always includes an admission of guilt to the offended party. The person who has committed the offense is required to confess the wrongdoing and express remorse to the offended person for the sinful acts. Afterwards, the offender is to make a commitment not to repeat the offense. Ultimately, the purpose of this process is to express guilt and remorse to the offended person in an attempt to gain forgiveness so that the two people can repair the relationship. Without this process being fulfilled in its entirety, forgiveness is impossible. Step Three: Forgiveness -- If the first two steps have been completed, and the fruits of sincere repentance have been observed, Jesus commands the offended party to forgive his brother, as He has forgiven us. "After these things the Lord appointed other seventy also, and sent them two and two before his face into every city and place, whither he himself would come. Therefore said he unto them, The harvest truly is great, but the labourers are few: pray ye therefore the Lord of the harvest, that he would send forth labourers into his harvest. Go your ways: behold, I send you forth as lambs among wolves. Carry neither purse, nor scrip, nor shoes: and salute no man by the way. And into whatsoever house ye enter, first say, Peace be to this house. And if the son of peace be there, your peace shall rest upon it: if not, it shall turn to you again. And in the same house remain, eating and drinking such things as they give: for the labourer is worthy of his hire. Go not from house to house. And into whatsoever city ye enter, and they receive you, eat such things as are set before you: And heal the sick that are therein, and say unto them, The kingdom of God is come nigh unto you. But into whatsoever city ye enter, and they receive you not, go your ways out into the streets of the same, and say, Even the very dust of your city, which cleaveth on us, we do wipe off against you: notwithstanding be ye sure of this, that the kingdom of God is come nigh unto you. But I say unto you, that it shall be more tolerable in that day for Sodom, than for that city" (Lk. 10:1-12). "Let no man deceive you with vain words: for because of these things cometh the wrath of God upon the children of disobedience. Be not ye therefore partakers with them. For ye were sometimes darkness, but now are ye light in the Lord: walk as children of light: (For the fruit of the Spirit is in all goodness and righteousness and truth;) Proving what is acceptable unto the Lord. And have no fellowship with the unfruitful works of darkness, but rather reprove them. For it is a shame even to speak of those things which are done of them in secret. But all things that are reproved are made manifest by the light: for whatsoever doth make manifest is light. Wherefore he saith, Awake thou that sleepest, and arise from the dead, and Christ shall give thee light. See then that ye walk circumspectly, not as fools, but as wise, Redeeming the time, because the days are evil. Wherefore be ye not unwise, but understanding what the will of the Lord is" (Eph. 5:6-11). Unconditional forgiveness is canceling a debt to all those who intentionally offend us, whether or not they own up to what they have done and repent. Offering forgiveness without repentance, however, does not follow the biblical model of forgiveness, as previously outlined in Luke 17:3-4. The Bible says we are to forgive as God forgave us. It is written in Ephesians 4:32, "And be ye kind one to another, tenderhearted, forgiving one another, even as God for Christ's sake hath forgiven you," and Colossians 3:13 states, "Forbearing one another, and forgiving one another, if any man have a quarrel against any: even as Christ forgave you, so also do ye." However, God withholds His forgiveness until we repent: "And saying, The time is fulfilled, and the kingdom of God is at hand: repent ye, and believe the gospel" (Mk. 1:15). "I tell you, Nay: but, except ye repent, ye shall all likewise perish. Or those eighteen, upon whom the tower in Siloam fell, and slew them, think ye that they were sinners above all men that dwelt in Jerusalem? I tell you, Nay: but, except ye repent, ye shall all likewise perish" (Lk. 13:3-5). "Repent ye therefore, and be converted, that your sins may be blotted out, when the times of refreshing shall come from the presence of the Lord" (Acts 3:19). God does not grant forgiveness to those of us who continue to act with prideful arrogance against Him, and against our brothers and sisters in Christ. We must recognize our sin and repent to receive and enjoy God's merciful forgiveness. We must exhibit this same behavior in our relationships in the Body. God requires repentance and so must we. An unrepentant person maintains a false sense of control over his life through pride, which inevitably leads to destruction, violence, and animosity. This is because an unrepentant heart is conceived in the child of the devil: "The fear of the LORD is to hate evil: pride, and arrogancy, and the evil way, and the froward mouth, do I hate" (Prov. 8:13). "Pride goeth before destruction, and an haughty spirit before a fall" (Prov. 16:18). "A man's pride shall bring him low: but honour shall uphold the humble in spirit" (Prov. 29:23). Turning toward God is necessary to break the cycle of destructive behaviors and patterns of relating to others. If, as believers, we don't require repentance on the part of the offender, we stand in the way of that person coming to see his or her need for God and experiencing His forgiveness. To put it simply, forgiveness is a two-way process: repentance on the part of the offender and pardon on the part of the offended. The ultimate purpose of forgiveness is the healing of a relationship. This healing occurs only when the offender repents and demonstrates remorse, and when the offended one grants a pardon and demonstrates loving acceptance. When the offender does not take the first step, we have no other choice but to exercise inward forgiveness for the sake of our own peace of mind and tranquility. This is when we choose to no longer be a party to the unfavorable emotions we experience when we think of the malicious behavior. Although we are not required to forgive the unrepentant offender, we are commanded to pray that our enemies would come to repentance, especially of their sins before Christ, if they are not saved. "But I say unto you, Love your enemies, bless them that curse you, do good to them that hate you, and pray for them which despitefully use you, and persecute you; That ye may be the children of your Father which is in heaven: for he maketh his sun to rise on the evil and on the good, and sendeth rain on the just and on the unjust. For if ye love them which love you, what reward have ye? do not even the publicans the same? And if ye salute your brethren only, what do ye more than others? do not even the publicans so? Be ye therefore perfect, even as your Father which is in heaven is perfect" (Matt. 5:44-48). 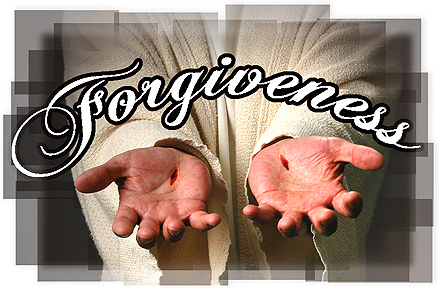 Outward forgiveness, in the case of an unrepentant offender, is something we turn over to God himself. Outwardly, only God can extend forgiveness to our enemies. This is a burden He gladly accepts on our behalf if we will simply allow Him to deliver us from the pain of this burden.